There seems to be more than one way to spell this little puff of goodness. I was going to make Moe pancakes for breakfast but then remembered that I wanted to try using my Aebelskiver pan. I've had this pan for at least six years and I think I used it once when I first bought it. My pan is a vintage cast iron Griswold. I found a video and recipe by Violiz2. These were so easy to make. Since Moe was expecting pancakes, he had his drizzled with maple syrup and I had mine sprinkled with powdered sugar. Mix the flour, baking soda, baking powder, salt and sugar together in a large bowl. Beat eggs, buttermilk and sour cream together. Add vanilla. Stir into flour mixture. Heat Aebelskiver pan over medium high heat. Add a little oil to each cup. (about 1/2 teaspoon or so). Spoon about 1/8 of a cup of batter into each indent. Let cook for 30 to 45 seconds. Use a tooth pick to make sure that the batter isn't sticking and when the bottoms are brown, use the pick to turn the pancake over. Serve warm with maple syrup or dusted with powdered sugar. They look light as a feather, Ann. What a delicious way to start the day. Delicious! I had a pan and now I wish that I had it still. There may be another in my future. These look like they would be fun to make. I first heard of these from Williams and Sonoma's web site. 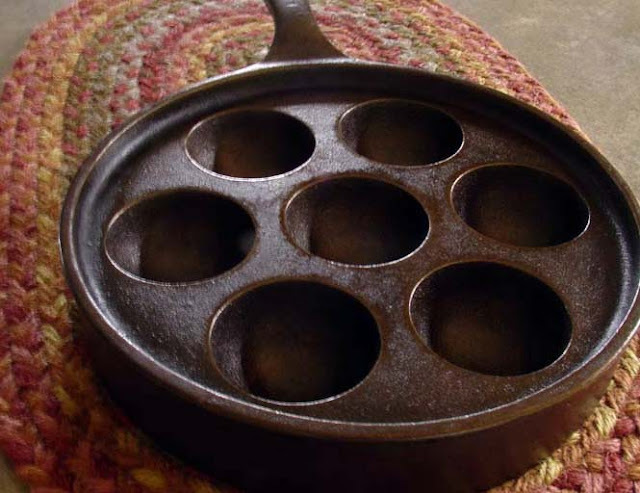 When I am in Seattle I thhik I see one of these pans in my future from their store. Oh those look so delicious! Moe is a luck, lucky man! I am a missionary in Germany and we have something very similar in the bakeries here. They are called Pfannkuchen (pancakes), the are dipped in white sugar when they come out and then filled with a jam, usually plum. They are very delicious. I saw the picture and thought that was what it was, very close though! 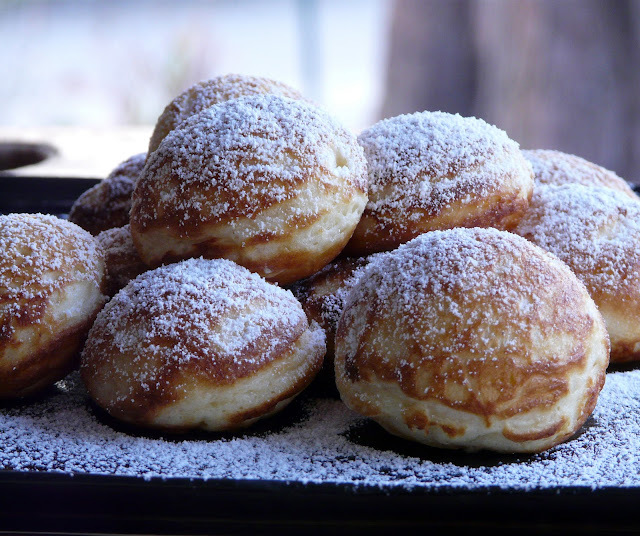 I've had my eye on an ebelskiver pan at W-S for months. Now I REALLY want to buy it - they look absolutely delicious! If you want them to turn out really nice, only turn them a little at a time, not all at once, letting the batter complete the sphere in multiple turns. They end up fluffier and rounder, without the seam around the equator. I've read about these before AND saw the pan at Williams Sonoma. They look delicious! Definitely going to try them...you made them look easy! Yum. Maple syrup sounds good! 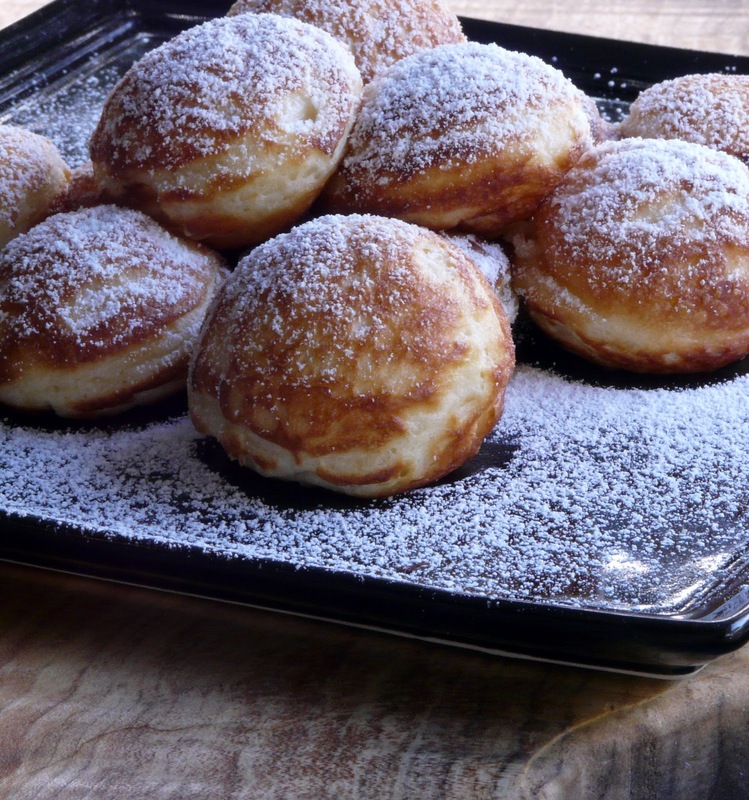 I cook ebelskivers at my business in Seattle (The Ebelskiver Lady) and I have to agree with @RandyHuyck - I turn them a quarter turn at a time, and they turn out as perfectly round balls. I use my mom's recipe, but now I'm inspired to try out a sour cream variation of the batter. Yum! I was actually pleased with my first attempt. Thanks for the advice on keeping them round. I'll definitely put your tip on turning into practice the next time I made the Aebelskivers. I was so excited to see these when I opened your page! I had gotten my MIL pan when she passed and have not made them in 4 years. I made them yesterday and we LOVED them; they were a bit tricky to turn at first, but once I got the temperature of the pan just right and practice turning, I had perfect balls ;-0 by the end. Great pan! I have a new Lodge that I plan on using tonight to make dessert! I've copied your recipe to try. I have my Danish great-grandmothers cast iron pan! The comment I have is to say...try beating the egg whites separately and folding them into the rest of the batter. Makes them much lighter and soo delicious!